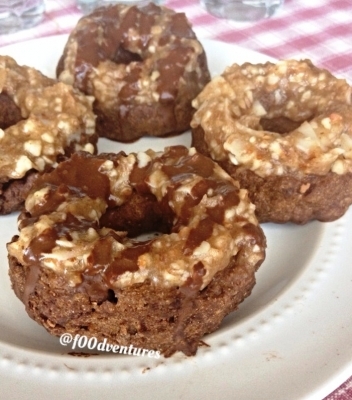 if you love the samoas girl scout cookies then you'll love these samoas inspired donuts made with quest vanilla protein powder for a nice dose of protein (9g protein per donut!). best part? These donuts only take ~5 minutes to make! Combine ingredients to make donuts ad mix well until a dough forms. Pull of a piece of dough and form into a long rope. Form into a donut shape. Repeat with the rest of the dough. Microwave 2-3 minutes until fully cooked. Set aside to let cool. Process almonds in a food processor for about a minute. Mix almonds with coconut, protein powder, and date caramel. Spread mixture on top of donuts and enjoy.